This May marks the 25th anniversary of American Wetlands Month, a celebration of the importance of wetlands to the nation's economy, ecology and social health. American Wetlands Month was created in 1991 by the United States Environmental Protection Agency (EPA) and its federal, state, tribal, local, non-profit, and private sector partners. During this month, Americans are encouraged to discover and educate others about the critical role that wetlands play in the environment and the significant benefits they provide — increased water storage and supply, improved water quality, reduced flood and storm surge risk, opportunities for recreation and cultural pursuits, and critical habitat for plants, fish, and wildlife. According to EPA: Wetlands are the vital link between land and water, where the flow of water, the cycling of nutrients, and the energy of the sun meet to produce highly productive ecosystems with unique plant and animal life. Wetlands may not be wet year-round. In fact, some of the most important wetlands are seasonally dry transition zones. As nurseries of nature, wetlands are among the most biologically productive natural ecosystems in the world, comparable to rain forests and coral reefs in their productivity and in the diversity of species they support. Important wetlands research is happening across the country. OCWD operates the largest constructed wetlands, the Prado Wetlands, in Southern California. They are located upstream of the Prado Dam in Riverside County. 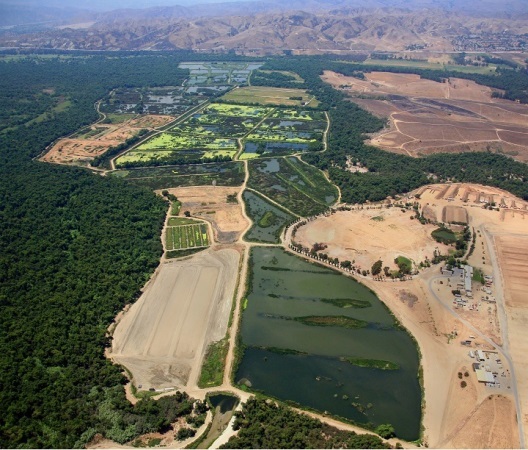 Modified from a series of duck hunting ponds located adjacent to the Santa Ana River in 1992, the Prado Constructed Wetlands (PCW) is a system of treatment ponds designed to remove nitrate and emphasize the characteristics of natural wetland ecosystems. A network of levees, weirs and conveyance piping control water flow through the ponds where it undergoes sedimentation, assimilation, adsorption, and denitrification treatment processes, all of which are specifically designed to remove nitrogen and other pollutants from tertiary-treated wastewater in the Santa Ana River. On average, Prado wetlands removes approximately 30 tons of nitrate a month by reducing nitrate in Santa Ana River flow from 8 milligrams per liter (mg/L) to less than 1 mg/L during summer months. Although the flow upstream of Prado is meeting Regional Water Quality Control Board (RWQCB) Objective of 10mg/L for the river, the OCWD Groundwater Basin objective for nitrate is 3.4 mg/L, making removal of nitrate in the wetlands an important factor in meeting basin water quality objectives. In addition to nitrogen, significant reductions in other pollutants following treatment in wetland ponds include pharmaceuticals and synthetic organic compounds. With the ultimate use of this water to re-supply the OCWD groundwater basin, these studies highlight the value of the wetlands as a natural water treatment process and protective barrier to limit pollutants. Currently, the Prado Wetlands are part of a nearly two-year-old pilot project performed in conjunction with the National Science Foundation (NSF) supported Engineering Research Center (ERC) for Re-Inventing the Nation's Urban Water Infrastructure (ReNUWIt). ReNUWIt is comprised of researchers from Stanford University, UC-Berkeley, Colorado School of Mines, and New Mexico State University. Known as the Prado Open Water Unit Process (POWUP) project, it is investigating the use of vegetation-free, shallow ponds to provide a potentially broader range of water treatment benefits to Santa Ana River flows with reduced maintenance costs. Three 800-foot-by-100-foot POWUP test cells are currently in their second year of operation. There is a lot to learn about wetlands and why we need to preserve, protect and expand them. Information about wetlands and the important benefits they provide can be found in EPA's wetlands fact sheets series, or by visiting the websites of its partners. To find a wetland near you, consult your local parks department, state natural resource agency, or the United States Fish and Wildlife Service. To learn more about what you can do to help protect and restore these valuable natural resources in your local area, visit What You Can Do to Protect and Restore Wetlands.